My opinion is the XV is a much better vehicle. but i understand why ALLL the RUSH have been sold. and most sold without having landed in Trinidad. A new corolla is 220,000 so the 229,000 price of a Rush is an easy sell. they market the rush as an SUV family vehicle and many believe in the Toyota name and hence trust established in quality. Even a piece of sheit SUV like the Rush? No way. Remember that 229 is introductory price. Actual price is 20k more. Same for the high spec model. So comparing 220k sedan to 249k "SUV" is not apples with apples. Arent there options for SUVs better than the Rush in the 249k price bracket? carluva wrote: I meant to post this sometime ago but only just got around to doing so. A few weeks ago, I went to see the Toyota Rush at TTTL's showroom, Barataria. I actually organized a demo of the unit cause I told myself that once it was impressive enough, I'd consider selling one of our rides (a Fortuner) use the cash to buy the Rush and have some cash left over. Man was I disappointed and glad I didn't sell the Fortuner as yet! Can't even imagine why its being called the baby Fortuner. I must admit that I am really disappointed that Toyota pitches this as a seven seater and I really cannot comprehend why people are purchasing this. The third row is cramped. i'm 5'-10" and can fit pretty acceptably in the third row of the Fortuner. The Rush is cramped, to the point where my body hurt after a few minutes. The second row is small and three adults cannot comfortable in the second row. Two adults will be comfortable. Dimension wise: its narrower than the RaV4 and probably just as long. So it looks out of proportion. The vehicle, while sold by Toyota is made by Daihatsu, which is owned by TMC. So the looks of the Rush are reminiscent of previous models like the Terios which if you know the latter will agree that there is that similar out of proportion resemblance. I have three kids and all three are in varying degrees of car seats. For some time, we had one car seat in the second row and used the third row for two other car seats. Now for the comfort of all, all three car seats are in the second row and the third row is folded up but available to use should the need arise (which it has). If you are a family which has three small kids who are not in car seats/booster seats, then maybe the Rush vehicle can work. It should be noted that three car seats will never comfortable nor safely fit in this vehicle. The second row can only take two car seats but then a third passenger will have to climb through the trunk to enter the third row, For a family with two kids, maybe this can work with the third row up, but then one can argue that it basically becomes a five seater when there are better and similarly priced 5 seaters on the market. Sure some people would say that "its a Toyota" with the normal resale value blah blahs. But in reality, this is a Toyota badged Daihatsu. I didn't waste time going for a test drive as the Rush did not appeal to me as maybe other vehicles in Toyota's (and perhaps other dealers') lineup. Even the salesman, a good colleague of mines, told me don't waste time to sell the Fortuner for the Rush as this wold be a dumb mistake. I now see why. Point to note, that its a 1.5L engine and while I was there, someone demo'd it before me and then another person right after me. On both occasions, the respective salesman told the customers that they will take the vehicle up the Lady Young to demo the capabilities of the engine and other features (presumably hill descent or hill start). Personally, I think it's to show that this 1.5L engine can make steep hills but even so, I think it'll struggle making a Maracas or Las Cuevas run with five passengers and beach gear/coolers. Won't even trust this on a Blanchicheusse Road! I cant even imagine why people are running down this vehicle and the shipments are being sold out even before arriving in the country. The few I saw on the road had the third row up, so I'm wondering if this was purchased as a seven seater or as a five seater. So while I'm an advocate for more new seven seaters on the market, I think that this Rush is not worth it and its back to the drawing board to see who can bring good seven seater alternatives other than the conventional SUVs or minibuses. Isn't the gt86 the same as the Subaru BRZ? Were there any reviews of the BRZ on tuner? So guys, Southern Sales has been busy as of late. They received the refreshed Sorento and Sportage. They also got the new 2019 Cerato 1.6 with the speculated iVT transmission (to be confirmed) - special intro price of $180k. And on the Mazda side of things, they got the 2018 refreshed 6. Diamond Motors I think finally got back some Sporteros to sell and that price I understand is $289k. The all new Jimny pricing is hush hush at LSM right now but they are expected to create a big launch out of that one. Rumors of the Hyundai Kona and Kia Stonic have remained what they are...and as I mentioned recently, in a few short months we will welcome the onslaught of the 2019 Rav4, Forester and Eclipse Cross. Finally, a Civic Si or Type R should be in Honda's showroom soon according to my source. 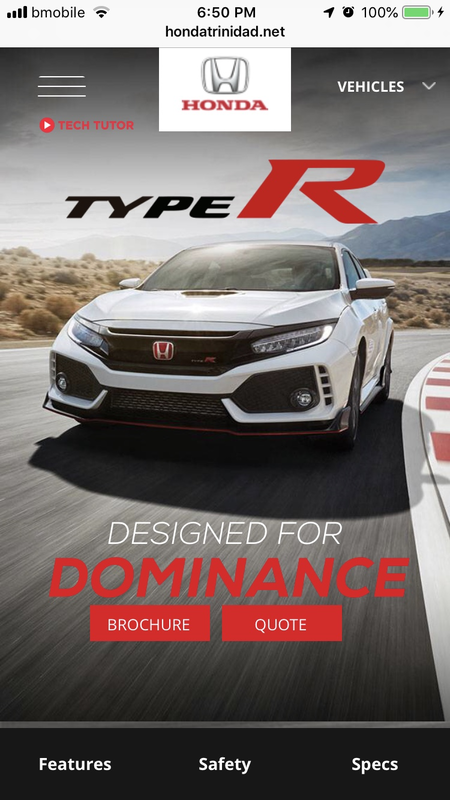 Could imagine the price of that Type R. Noticed they have had it listed on their site for a while but when you try to get further info you hit a wall. I hope they did their due diligence on that one, because if 95RON is insufficient for those high performance Civics then owners may face engine issues. Isnt there a serious flaw with the manual transmission on the Civic type R? Yes but for all the type r's affected, whatever factory it coming from will not be the same for us and the transmission supplier would be different lol...so I anticipate that we would be cool. You forgot to put in quotation marks and end with that's what the Honda sales team would say. He bought a new car and he had to implement a solution and not Honda? Ent Honda just issued a massive recall? NR8 wrote: Ent Honda just issued a massive recall? Most likely they will replace the transmissions and keep it quiet since its not a high volume seller. Honda has a record of not admitting to stuff ... They had CVT issues in the past and then starter problems and gave owners the run around. Luckily their cars dont seem to have a lot of issues so they dont get tarred and feathered by the general public like VW group cars do. They admitted to this because the recall wasn't their fault ... it was the airbag makers fault. Anyone got any idea if and when Lifestyle motors will start bringing in the Suzuki Swift Sport Turbo. They just issued a recall on a problem that started in 2003? the TSB was released in 2008 for the 3rd gear grinding issue which was reported in vehicles built as early as 2003.. By this time most of the affected vehicles were out of warranty... Meaning less for Honda to spend on repairs. drchaos wrote: You forgot to put in quotation marks and end with that's what the Honda sales team would say. Cerato looks good but it's a Kia .